Hello Friends! Welcome to my blog and another release from Crafting Desert Divas. Today I am share a sneak peek a the new CDD Dragon Tales Stamps and All Together Sentiments. 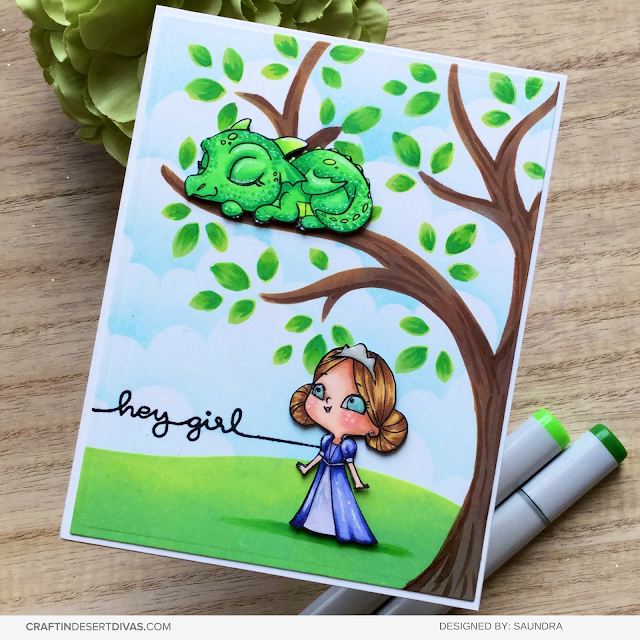 The Dragon Tales stamp set is a 5"x7" stamp set filled with cute images to make so many fairy tale scenes. You've got castles, dragons, a princess, and knights in shining armor all included in this set. For my card I created a scene. I started by creating a background with CDD Hill Scene 2 Stencil to create my clouds and ground. For this I used Tumbled Glass, Twisted Citron, and Mowed Lawn Distress Oxide Inks. The tree was inked with Twisted Citron, Mowed Lawn, Gathered Twigs, and Vintage Photo Distress Oxide Inks and CDD Blooming Tree Stencil. I used my Copic makers to give the tree a little bit of detail. I colored my princess and dragon from the CDD Dragon Tales stamps using Copic markers and fussy-cut them out. Before I adding them to my card I stamped a sentiment from the new All Together Sentiments. These sentiments are designed to go across the card but I decided to stamp it a bit off my card. I popped the images up with some foam squares and added my panel to a white card base. Be sure to head on over the Craftin Desert Divas Gallery on Facebook to see even more projects using these new stamps. The full release will be available for purchase on Monday, December 10, 2018 in the CDD Shop. I will be back with more sneak peeks in a few days. See you then!